GREAT LOOKING...... Mini Aluminum Dog Tags. Custom engraved on one or both sides. Hardware attachments sold separately (see right). Need more than 2500 pcs? Please contact us for best pricing! Engraving options: Text file input $0.15 ea. ; Consecutive numbering: $0.15 ea. Image area 1.0" x 0.70"
Neck chains are packed separately. we will assemble the chains and tags for you! 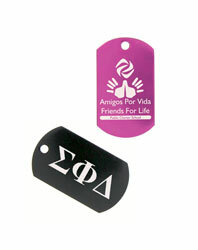 Mini aluminum dog tags custom engraved with your name, logo or message on one or both sides. Constructed from the same high quality aluminum as our standard size tag. Available with your choice of neck chain or split ring. Make a charm, keyring, pennant, etc. Please contact us for applicable rush charges.